A great shot of 2056. I couldn’t be more proud of how these rookies performed last weekend. Watch out Atlanta, here we come. I can’t wait to see all of this bot at GTR! Hey! Congrats saw you at the waterloo regional you guys are awesome! Team 1535 will see you in ATL! I loved when your auto went to the other side of the rack. We had plans on doing that but you guys pulled it off! Amazing bot! good luck in atlanta can’t wait to see you guys again in Toronto! One of the best rookie performances I’ve ever seen. This team came out flying. Congratulations on an amazing performance. 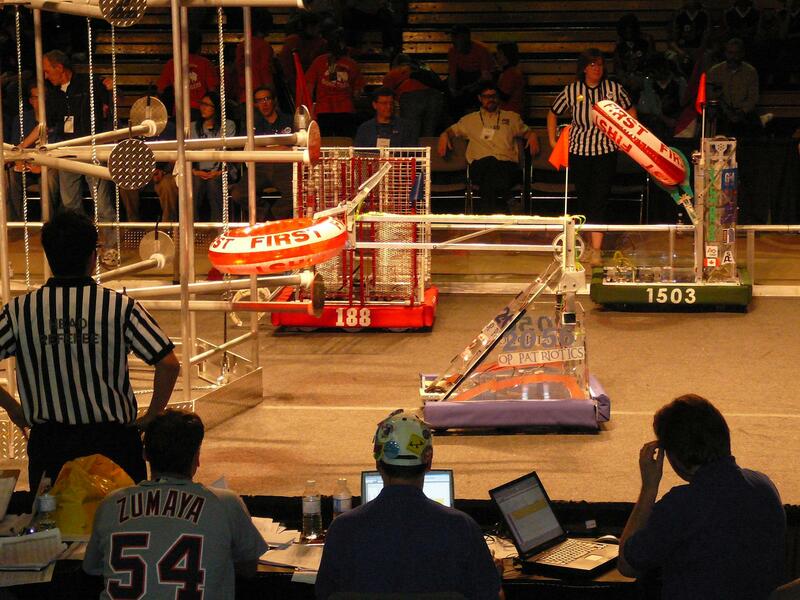 Is the parallelogram type arm similar to team 1902: exploding bacon? Yes. It is commonly referred to as a “4-bar linkage” (although I have also heard it referred to as a parallelogram linkage). A number of teams use it, including 1902, 2056, 148, 1114, and 1369. I absolutely love this robot, one of the most simple and effective designs this year. My favorite thing about it is the killer auto-mode that puts tubes on the other side of the rack. Nothing is more depressing than seeing an opposing keeper on your side of the rack. I look forward to seeing how this robot does at Atlanta, look for it to go far. Heh. This thread seems so cute now.